Caryn Hartglass: Hello, I’m Caryn Hartglass and you’re listening to It’s All About Food. Thank you for joining me today, it’s a great show coming up, I know it. There are so many things that are so important to talk about and we’re going to do that today. I’ve got two parts to the show. We’re going to start with Barry Estabrook, the author of Tomatoland. He’s worked on a dairy farm and done some commercial fishing as a young man, and that convinced him to decide to write about how food was produced because he thought it was a lot easier than actually producing it. He lives on a 38 acre track farm in Vermont and he was formerly a contributing editor at the late lamented Gourmet magazine. He now serves on the advisory board of Gastronomica, the Journal of Food and Culture, and writes for the New York Times, the Washington Post, TheAtlantic.com, MarkBittman.com, Saveur, Men’s Health, and many others. His article for Gourmet on labor abuses in Florida’s tomato fields received the 2010 James Beard Award for magazine feature writing. We’re going to be talking about his new book, Tomatoland – about how agriculture has ruined the tomato in all ways gastronomic, environmental, and in terms of labor abuse. Welcome, Barry, to It’s All About Food. Barry Estabrook: Well, it’s a pleasure to be here. Caryn Hartglass: Gosh, I am so excited to talk to you. You have no idea. I read the book, loved it – can’t say I love what it’s about, but I do love tomatoes. I’m just continually overwhelmed with what goes on with our food system with agriculture, and I have to say that I wasn’t aware of what was going on with tomatoes. This book exposes so many horrible things that are going on with that precious little food. Barry Estabrook: Yeah, and you have to ask for what, because these industrial little tomatoes that are the result of this process certainly bear no resemblance to what we’re getting from our own gardens or farmers markets at this time of year. Caryn Hartglass: You know, it’s interesting – for what, exactly. Because after reading your book, I’ve learned that that tomatoes that we produce in industrial farms in Florida have no taste, have little nutrition, they’re difficult to produce, and the people that are growing them, the workers, are treated horribly. What’s the benefit of making these tomatoes? Barry Estabrook: Well, you know, about the only benefit I can see is that some people like a little bit of coloring on their salads in the wintertime, and frankly I don’t think it’s a benefit that’s worth the price that’s paid. Caryn Hartglass: Well, what drives me crazy, something that I talk about all the time on this show, is that many people don’t know what’s in their food. They don’t know how their food is produced, and they don’t even know what food should taste like anymore; they’re so overwhelmed because they use so much salt, sugar and fat – everything is disguised, their tastebuds are numb, and it’s a very dismal thing indeed. Caryn Hartglass: Oh, that’s making me cry! Barry Estabrook: One woman in San Francisco used to say she hated tomatoes until she moved out there and was able to get some farmer’s market tomatoes. Caryn Hartglass: Oh sure, there’ nothing like a fresh garden, warmed-by-the-sun tomato that you can bite into like an apple. Caryn Hartglass: Now, speaking of salt, I’m always telling people to stop adding the salt. But one thing I learned in your book is that tomatoes have been hybridized and changed so much that there is so much more sodium in them then there was originally. Barry Estabrook: Yeah, I found it startling. This is the United States Department of Agriculture’s own nutrition figures, and it turns out that the supermarket fast food tomatoes of today, they have 30% less Vitamin C, calcium, niacin – you go down the list of vitamins, and it’s less, less, less. But amazingly, they have 14 times the sodium that a tomato had back in the 1960s. So this seems to be the result of all of our breeding efforts. Caryn Hartglass: Yeah, it’s crazy. So crazy. You take a whole book to explain some of the questions I’m going to ask, but how did we get to such a crazy place? You talk in your book about how tomatoes are grown in the sand. And they don’t naturally grow well in Florida. Caryn Hartglass: Where the ground is dry. Barry Estabrook: – where you’ve got these endless, low-humidity, sunny summer days. Florida is very, very humid. And everything that would kill a tomato – every disease, every fungus, every mold, every rust, every insect that would do in a tomato thrives in humidity – so to get a crop, they have to wage chemical warfare. The Florida handbook that goes out to commercial growers from the government lists 110 different pesticides, fungicides, and herbicides that they can spray on their plants during the few months that they’re in the field just so they survive. Caryn Hartglass: Okay, so not only do these tomatoes have no taste and have very little nutritional value, and have lots of extra sodium that we don’t really need, they’re also laced with all kinds of toxic chemicals, and not only are they bad for us to ingest, but what’s really heartbreaking are the workers that are exposed to these chemicals. Barry Estabrook: Well, there are a couple of great tragedies, and that is certainly one of them. I probably talked to four dozen tomato workers while researching the book and I asked them all one question about a pesticide. And they looked at me as I I had asked them, “Do you generally put your pants on in the morning?” I mean, of course man, all the time. Caryn Hartglass: And of course there are regulations in place that that’s not supposed to happen. Barry Estabrook: Oh, of course, there’s regulations in place that that’s absolutely not supposed to happen. There are set intervals, called re-entry intervals in the jargon of the Environmental Protection Agency, that are supposed to elapse between when you spray a field and when workers are allowed back in. But they are completely ignored. The vast majority, study after study has shown, of farm workers, get sprayed, to the point where their clothes are soaking wet with the pesticide. Caryn Hartglass: I’m going to jump around here. I am not someone who believes in little government; I believe in government agencies that protect us, but they have to do what they say what they’re going to do. Do you have any idea why that doesn’t happen? Barry Estabrook: Well, the governmental department that’s in charge of these matters in Florida is called the Department of Agriculture and Consumer Affairs. You can see right away that there’s kind of a built-in conflict of interests. Caryn Hartglass: We have that in the federal government too! Barry Estabrook: When the same department that’s supposed to promote big egg is also in charge of protecting people. At one point, there were only 14 pesticide inspectors for the entire state of Florida, which is one of the largest agricultural states in the nation. In southwestern Florida – this was a few years ago – where the workforce is basically all Hispanic, the inspector there didn’t speak any Spanish. By comparison, California, which has slightly stricter rules, it has several factors of ten more cases of reported pesticide exposure. It’s not necessarily because that many more workers are exposed as a percentage of the workforce, it’s just they get reported there. Caryn Hartglass: Why would California be better than Florida? Barry Estabrook: One simple case is California doctors, in order to get reimbursed through the compensation program, have to report pesticide poisonings. Florida doctors do not – they’re supposed to, but they don’t have to do it to get paid. Caryn Hartglass: It always comes down to money. Barry Estabrook: There’s sort of an incentive when you’re a busy physician not to fill out these forms when there’s no website. Caryn Hartglass: I’m always insisting to everyone I talk to that they should but organic produce all the time and try and look for the ones that are reasonably priced; they don’t have to buy the ones that are outrageously expensive. It’s so important to support organic. The piece that people miss – not just that they shouldn’t consume these toxic residual pesticides, besides on their food – but it is so inhumane with what goes on with the exposure to the workers. Barry Estabrook: You know, the saddest case I cam across concerned three female workers. They were neighbors; they lived in the same tiny work camp of a couple dozen trailers and shacks. They all worked for the same tomato company. And they all became pregnant at about the same time. They knew that this was not good for their future babies. They knew it because their eyes would water, their throats and lungs would burn, they would feel dizzy and almost pass out, they broke out in rashes, and so they went to their boos, who also happened to be the landlord, and said, “Look, we’re pregnant; we want to stop working.” And he said, “You can stop working, but clear out of your trailers because I need that space for someone who is willing to work.” So they were in this awful – I mean, try to put yourself in their position. They were pregnant and they knew they were hurting their babies. But yet they had to have a place to live more than ever for when the babies came. So they were caught in this trap. And sure enough, all three babies were born horribly deformed. Caryn Hartglass: Yeah, without arms and legs. Barry Estabrook: One was born without arms and legs, one had a jaw deformity and had to be fed through a tube, and the other was born with awful deformities. They didn’t even know if she was a girl or if he was a boy, the doctors, and it turns out that he was a boy, and he died within a few days. All three women. Caryn Hartglass: One of the things that makes Tomatoland a great book, not just what you’re talking about, is that there are so many stories in the book about individual people. And they are heartbreaking, so many of them. In addition to these women, but a lot of the men that work are treated like slaves – where they’re locked into these places that they were given to sleep in at night and not allowed to stop working for a particular place – they’re slaves. Barry Estabrook: Yeah, you know, they’re not treated like slaves. This was slavery. Let me run down a short list: being shackled in chains at night; being locked in the back of an airless produce truck so that they would be ready to be transported to the fields in the morning; being beaten if they didn’t work hard enough; some in some cases killed or severely beaten if they tried to escape, and they received no pay, or virtually no pay – that’s slavery. And in fact, sadly, it’s not rare. There have been 1200 people freed from slavery in Florida’s fields in the past 10 or 15 years. And these are court cases; I went through all the documents. Caryn Hartglass: These are the ones that we’ve found. Barry Estabrook: The U.S Attorney down there told me that’s just the tip of an iceberg. It’s very, very hard to bring charges of human trafficking, which is the euphemism for slavery, to court. You need witnesses and a lot of time. If someone gets freed, he’s not going to wait around or go to the police; he’s going to run. Caryn Hartglass: I talk a lot about the factory farming of animals for food, and it’s a really horrific scenario there. It’s bad for the animals; the meat that’s produced is really unhealthy; we get E. coli and salmonella and all kinds of problems; and now we’re talking about humans who are treated like slaves. We can’t get into factory farms to see what’s going on; is there a way to see any of this? Barry Estabrook: It’s difficult. If you go to a typical tomato field in southwestern Florida, where the roads go into these fields, there’s armed guards, there’s gates that come down, and there are armed security personnel there. As far as seeing what’s going on, it’s not a whole lot different than some of these factory farms. It’s like you said earlier: they really have no interest in the public knowing how its food is produced. Caryn Hartglass: Okay, so let’s just recap all of the horrors behind the tomato for a moment. We’ve got pesticides and herbicides that are affecting us and also the people that are using these things on the plants; we’ve got a tomato that has no taste and little nutritional value; and it’s a business that doesn’t even make a lot of money. Barry Estabrook: Well, the same factor that accounts for out tasteless pork chops and rubbery chicken and bland eggs that give us salmonella, it’s been a race to the bottom for prices. That’s what’s been happening: cheaper, cheaper, cheaper. And they produce these commodity tomatoes that are designed not to be distinguished from each other. They’re designed to be the same, whether you get them from Mexico or Florida or wherever. And the only thing that matters is low prices. What happens when that’s your main goal is that everything else falls by the wayside. Caryn Hartglass: So when people are eating tomatoes on their fast food sandwiches and burgers and salads and are eating tomatoes out of season, when they have no taste, think about the story behind that tomato. It’s not a pretty one. There is hope though. Barry Estabrook: In fact, the United States Attorney for the southern district of Florida, I asked him a question: “If I eat these grocery store or fast food tomatoes, is there a chance I’m eating something that’s been picked by a slave?” He looked at me and said, “It’s not a chance. If you have eaten these tomatoes, you have eaten a fruit picked by the hand of a slave.” And that again, that’s the US Federal Attorney down there talking. He’s not a man prone to hyperbole. Caryn Hartglass: Right. That’s devastating. But there is hope. There are good things happening. So now I want to talk about the brighter side of the tomato. So there are some people in Florida that are working toward making the industry down there better, and there are some good examples in your book about that. And what do you think, should we be growing tomatoes in Florida? Barry Estabrook: From a climactic point of view, and from a soil and nutrition point of view, basically from a horticultural or botanical point of view, no. It’s the last place in the world you should be growing tomatoes. But it is warm at a time of year when the northern 2/3 of the country is frozen. So the reason they grow there is strictly a marketing one, an economic one. You can get a tomato up to Chicago or New York City or Saint Louis in a day or two with a loaded tractor trailer of tomatoes. So that’s why they grow them there. Caryn Hartglass: Well, how would you do it? Caryn Hartglass: That’s true for any fruit or vegetable. Barry Estabrook: And I think tomatoes probably more so than most fruits and vegetables. But you’re right, so if you can grow your own, do it. Tomato plants love to grow and tomatoes are a great sort of gateway fruit for gardening. Caryn Hartglass: Just don’t water them too much! Barry Estabrook: Or go to the farmer’s market this time of year. If you eat tomatoes that are in season and grown locally, you’re going to get tomatoes that are full of flavor, often don’t have the chemicals on it, because these small farmers are frequently organic, the working conditions that I discovered in farms that supply farmers markets are very good; the employees receive a decent hourly wage. Caryn Hartglass: They’re not chained in at night. Barry Estabrook: They’re not chained at night. What I do is I make a complete embarrassing tomato hog of myself this time of year. It’s not common for me to have them three times a day – fried at breakfast and on a sandwich at lunch, then a salad for dinner. And then I make up a big pot of pasta sauce before the end of tomato season and freeze that individually. Come first frost, I’m sick of tomatoes; I’m quite happy to go without them for the rest of the winter. Caryn Hartglass: Well, just talk about canned tomatoes for a minute, because I remember reading that the canned tomatoes aren’t the ones that are growing like this in Florida? Barry Estabrook: Right, canned tomatoes and fresh tomatoes may as well be apples and oranges. Canned tomato industry in the United States is concentrated in California. And canned tomatoes, they’re called processing tomatoes because they’re the ones that go into ketchup or salsa or tomato paste, so they’re grown in California. The varieties they use for those tomatoes, the tomatoes all ripen at once. Unlike the slicing tomato varieties, like your garden tomato, a single plant will yield over a period of 6 or 8 weeks. Caryn Hartglass: Which is not very practical for a big business. Barry Estabrook: Well, that’s why they have to be handled and picked. The ones in the processing tomatoes all ripen at once so they can kill the vines and pick them mechanically. The big machines go through and swallow up the vines and kind of spit them out one side and then put the tomatoes in a truck. They’re hauled off immediately to be processed. They’re picked in the morning; they’re boiled and cooked that afternoon. So there’s no problem with keeping or anything like that. It’s a whole different business. Caryn Hartglass: Do you have any feeling about canned tomatoes? In terms of eating them – positive or negative? Barry Estabrook: In most cases, canned tomatoes are intentionally designed to be blank tablets upon which the processor can layer whatever flavor they want. Although they tend to be very inoffensive. Because, like I said earlier, they might be destined to become a pizza sauce, or they might be destined to become ketchup. The point is, they’re going to get a lot of stuff added to them. Barry Estabrook: And even when you cook them at home, you do add onions and garlic. Caryn Hartglass: But they do have a tomato taste to them. Barry Estabrook: They certainly have more than the fresh tomatoes in the wintertime. Because again, Florida tomatoes are picked bright green. They’re picked green and they’;re taken to warehouses and exposed to ethylene gas which causes them to beautifully turn that rosy red color. It doesn’t mean they’re ripe; it’s just ethylene gas the plant emits when it wants to turn a fruit color, and they do this artificially so these tomatoes will turn the right color, but they’re not necessarily ripe. While a processing, canning tomato does get to ripen in the field. Caryn Hartglass: Oh goodness. Okay. Now we also get tomatoes from other countries; there’s some competition going on in Mexico. Are they doing the same thing that’s going on in Florida? Barry Estabrook: I concentrated my research on Florida intentionally because I really wanted to look closely at big agriculture through one very specific window. Everything I have heard and read about tomato production in Mexico, it’s much worse on all counts in Florida. The pesticide use and the labor conditions are much worse. And that’s who Florida is competing with. Caryn Hartglass: Yes. And maybe not doing so well in the competition. Barry Estabrook: There’s a tomato war going on, whether you know it or not, and the Florida producers are each year are fighting a rear-guard action; they’re losing market-share, during the heart of the winter they’re losing it to Mexico and during the seasons of spring and fall, they’re losing it to hydroponic producers, either in the United States, or in Canada. They’re being squeezed. Their percentage of the market is getting smaller each year, and Mexico’s is growing each year. Caryn Hartglass: Now oe thing I was really surprised to find out about was the tomatoes that are on the vine that are sold in stores, a lot of times they’re more expensive than the ones sold separated from the vine, we always get a feeling that those are a better tomato. And you wrote that it was the vine, the leaves that were smelling and the tomato may not be any better. Barry Estabrook: That’s true; it’s a marketing trick. The vines give off that tell-tale scent; once you smell a tomato vine, you never forget it. And our sense of smell plays wonderful tricks on our minds. The smell of the vines trick the people into thinking that the tomato on that vine is going to taste good. Some of them taste okay, but a lot of them are just as bland as the less expensive, pinkish tomato to the other side. Caryn Hartglass: I do love the smell of a tomato vine. I live in New York City and we have a very small terrace; we try to grow things and I’m realizing that I’m probably going to have to do something because things aren’t growing as well as they used to – it’s probably because I’m not feeding my soil. But I have grown tomatoes. This year, I didn’t even plant any seeds, but a few plants just decided to pop up, which was very nice of them. But it’s taken me a while to figure out the watering thing, and now I think I understand it. We’d probably watered them more earlier and then realized that they don’t require that much. Barry Estabrook: Yeah, I think you’re right. Lots of people have good success growing tomatoes in pots on balconies. I think the one thing you can’t control is sunlight. If you don’t have sunlight, you’re not going to get a good crop of tomatoes. If you have a bright, sunny spot, and a container, and fertilizer, and watch the water – not too much, but don’t let them dry out to the point where they start to wither – tomatoes are very happy to grow. I have a friend in Manhattan who lives right near Ground Zero who produces a very nice assortment of tomatoes on his balcony. Caryn Hartglass: Wow, that’s what I aspire. Barry, we’ve come to the end of this part, and I wanted to thank you so much for speaking with me today. 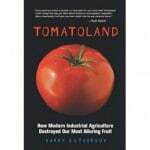 I really want to encourage everyone to read this book; it is so important – Tomatoland. Also, go to the website, politicsoftheplate.com. There are so many great articles about what is going wrong with our food today. Thank you so much for the work that you’re doing. Barry Estabrook: Well, thank you so much for having me. Caryn Hartglass: I look forward to meeting you very soon!